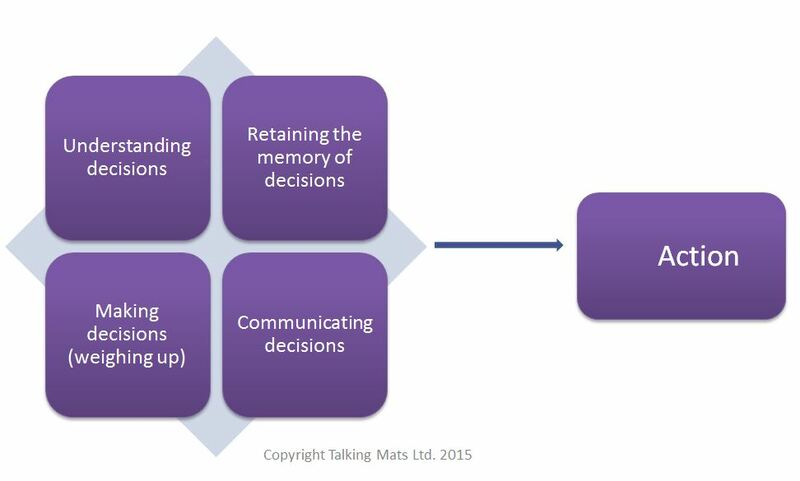 How can Talking Mats support capacity to make decisions? The inability to make a decision could be because of a learning disability, mental health problems, brain injury, dementia, alcohol or drug misuse, side effects of medical treatment or any other illness or disability. Click here for further information. Both the Mental Capacity Act (2005) in England and Wales and the Adults with Incapacity Scotland Act (2000) identify the following components which determine whether or not someone has capacity to make their own decisions. • Each individual has a different capacity to make decisions about different aspects of their life. We have been running seminars on how Talking Mats can be used to support a person’s capacity to make decisions.The diagram below illustrates some of the comments we received form participants at a recent seminar about the benefits of using Talking Mats to support decision making. Click on the diagram to enlarge. The process of completing a Talking Mat helps people retain their view and if they have memory problems the picture of the mat is a good prompt to enable recall. Its worth noting that our brain processes visual images 60,000 faster than text! This entry was posted in Aphasia, Blog, Capacity, Communication difficulties, Dementia, dysphagia, Learning disability, Participation and tagged capacity, Communication difficulties, Participation, symbols, Talking Mats on February 20, 2015 by Joan Murphy.